The British pound has begun to fall once more on the international currency markets. It may be further helped on its way by the loss of the AAA credit rating. This will have important domestic economic consequences.The currency is also being talked down by a number of officials, effectively including both the current governor of the Bank of England and his appointed successor. Their hope is that a weaker pound will boost Britain’s woeful export performance, and perhaps lead to a revival of business investment in the export-oriented sectors of the economy. One key problem in pursuing this policy is that it has already happened in the recent past and failed. Between 2008 and 2009 the pound fell by approximately 30% against the US Dollar. Against a basket of currencies (represented by the Sterling Trade-Weighted Index) it fell by over 25%. This was effectively a significant devaluation of the pound. Yet even in nominal Sterling terms, exports barely grew. 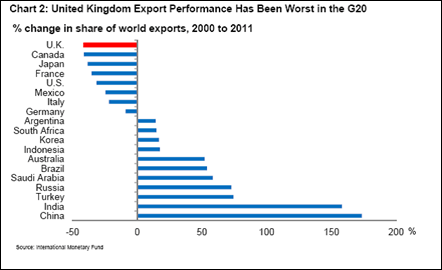 Britain’s share of world export markets actually fell, from 3.5% in 2008 to 3.2% in 2012, continuing a long-term trend. The effect of the devaluation was to push up the Sterling value of imports. This, combined with Coalition measures such as the increase in VAT and higher charges for transport and domestic fuel bills, pushed inflation higher. Britain was the only major industrialised economy that experienced ‘stagflation’ during the crisis – that is a simultaneous economic decline or stagnation along with accelerating inflation. Using a common measure such as US Dollars for international comparison, the UK became an incredible shrinking economy, the biggest absolute decline of any major economy. Real wages and incomes also shrank dramatically, as the effect of wage freezes and welfare cuts were magnified by sharply rising prices. This ought to be a lesson for all those who argue that a simple exit from the Euro and large devaluation is the remedy for the crisis-hit countries of the EU. Britain is outside the EU and experienced a large devaluation. The sole consequence was higher inflation and lower real incomes. One of the reasons why membership of the Euro remains so popular even in the crisis-hit countries is that repeated devaluations punctuated the preceding decades of those economies – and failed to raise relative living standards. Currency exchange rates are simply relative prices so that devaluation can reduce the relative price of the same or similar good. But the effects of global competition mean that an improvement in relative price competitiveness will not last if investment levels fail to match competitors. This relative underinvestment is the key structural failing of the British economy. According to recent data from the Office for National Statistics productivity is 16% below the rest of the G7 and has fallen relatively by 10% during the crisis. This has resulted in a structural deficit on the external accounts. The deficit on the current account, which is equivalent to the British economy’s borrowing from the rest of the world, has widened to 3.7% of GDP in the first three quarters of 2012, compared to zero in the depth of the recession. Borrowing is either conducted for consumption or for investment. But as SEB has repeatedly argued, British investment has slumped. It is now just 14% of GDP. This is the cause of the slump in relative productivity, even compared to the rest of the G7, all of which have lower investment now than before the crisis in 2008. As investment has already fallen therefore the current account deficit can only be corrected by a relative decline in consumption. This runs entirely contrary to the argument for increased consumption to resolve the crisis. But we have already seen that real wages have fallen during the crisis. This has reduced the consumption of most workers and the poor. Who will pay for investment? Fortunately, there is an alternative method of reducing aggregate consumption in order to boost investment. Alongside workers’ wages and investment Marx argued that consumption was divided into necessary consumption and the consumption of luxuries. In this category may be included all items not essential to sustaining well-being, but also all items which have no production capacity. The most important of these is expenditure on armaments. At £777bn the accumulated stock of profits held in cash at British banks is already a multiple of the funds required to restore all the output lost in the recession. At the same time dividend payouts to shareholders are at a record high approaching £79bn in 2012. Managerial and other bonuses (including in the City) are climbing once more. Economically, the renewal of Trident is a huge waste of resources, up to £100bn, as are increased military interventions, with lethal consequences. From these multiple sources, there is more than sufficient capital to increase investment and reduce consumption without in any way hurting the real incomes of workers and the poor. On the contrary, improving their living standards is both essential to and the ultimate purpose of socialist economic policy. The obstacles to this solution are political and social. The purpose of capitalism is to preserve and expand capital, hence its name. Any policy which infringes on, let alone overturns the absolute prerogatives of capital will be resisted fiercely. Instead what is currently on offer is a continuation of the long relative decline of the British economy. To alter fundamentally that path of decline would require a redirection of wasteful spending and idling capital towards investment. Instead, what is planned is a further erosion of the real incomes and consumption of workers and the poor. From that, there may eventually be some modest increase in investment. The decline of Sterling, and the inflationary effect it will produce is part of that project. This entry was posted in Economics and tagged consumption, Currency devaluation, erosion of wages and living standards, external trade deficit, investment, Michael Burke, public investment, shrinking economy, Sterling by syzygysue. Bookmark the permalink.